3 BR, 3 BA, Sleeps 6.with game room. 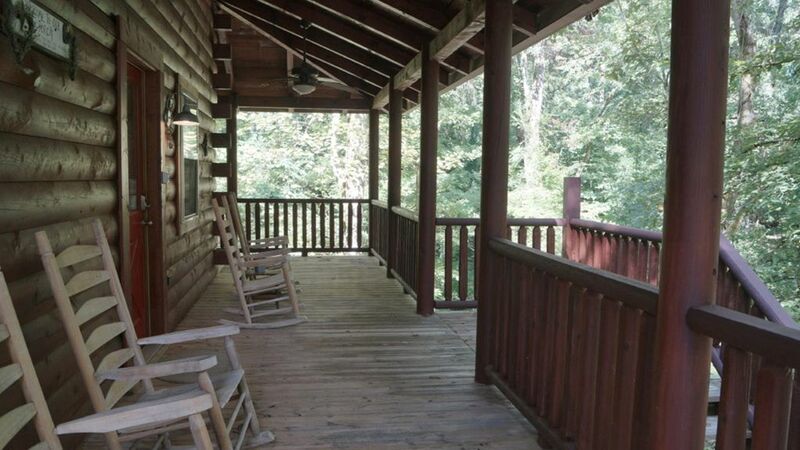 Knoxville log cabin, wood burning fireplace, wifi internet, wrap around porch with hot tub, game room/pool table, located in a rural setting with one other cabin. Send us a message for more information. 15 lbs or less, non-shedding, and housebroken pets are considered. 1 pet per property. No cats. MUST be pre-approved by KT Cabins. A pet fee will be charged in these cases and must be approved prior to rental. Check out the marina located less than two miles away with Sweet Peas Barbeque. Perfect get a way. Grounds and cabin are beautiful. Had every thing we could ever want. Close to town and easily accessed, we felt much more secluded than we in fact were! The hot tub and fireplace were lovely amenities. Plenty of cookware, but no kitchen staples. Sugar, salt and pepper would be nice to have on hand. Bed was comfy. All in all, grand. Just what we needed to attend a concert at the civic auditorium. I can completely envision renting all the cabins on the property for a large event. They are lovely and the environment sublime. The cabin was extremely clean and equipped with everything you need to enjoy your stay. This cabin was perfect for us! We had 6 girls for a weekend trip and there was plenty of room. This is close to everything we needed. We had a great time and this was a great place to stay! We had a great time. It was the perfect place for us to stay. The house was clean and comfortable. It was perfect for our Christmas gathering. Located closer to Knoxville Tennessee, 1 mile from access to the Tennessee River and a marina restaurant, The Knoxville Zoo and 30 minutes to Great Smokey Mountain National Park. 11 miles from Chilhowee Park where several events are held to include the Honda Hoot, Corvette show and auction, TVA&I Fair and more.